Jessica Watkins has been an avid health writer since January 2009. Her articles have appeared in the Pulitzer Prize-winning newspaper “The Clarion-Ledger” and in “Natural Solutions” magazine. She holds a Master of Arts in nutrition and journalism from New York University. 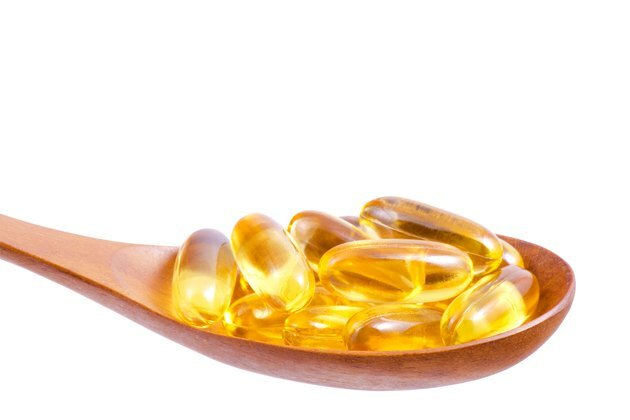 Fish oil is used to prevent and treat a variety of diverse conditions, such as depression, thinking disorders, glaucoma, diabetes, asthma, dyslexia and, most commonly, high blood pressure and heart disease. Though fish oil can provide significant benefits to the body, it has been known to also increase the risk of bruising. Fish rich in omega-3 fatty acids are mackerel, herring, tuna, mullet, salmon, trout, anchovies and sardines. A 3.5-oz. serving of fish provides approximately 1 g of omega-3 fatty acids. If you are not a fan of fish, supplements are another reliable way to get your daily dose omega-3 fatty acids. The dosage your body needs depends on the reason you are taking fish oil. Specific dosages are listed on the National Institutes of Health MedlinePlus website. Fish oil is a powerful tool to prevent coronary artery disease because it acts as a natural blood thinner. It inhibits the blood's ability to clot and reduces artery-clogging triglycerides, blood pressure and the risk of heart attack and stroke. Unfortunately, along with the fish oil's benefits comes unwanted side effects. Since fish oil is a natural blood thinner, it reduces your blood's ability to clot, and therefore, bleeding caused from capillary damage takes longer than normal to stop. As a result, when veins and capillaries break, blood leaks out of the vessels, pools under the skin and creates a bruise. Fish oil's ability to prevent blood clotting leads to the risk of prolonged bleeding and bruising, especially when consumed in combination with other blood thinning agents. The National Institutes of Health advises using caution when consuming fish oil in combination with blood thinning medications. Drugs prescribed to prevent blood clotting include aspirin, Coumadin, Fragmin, Lovenox, Persantine and Plavix. Some herbs and supplements, such as clove, danshen, garlic, ginger and ginkgo, are also known to slow blood clotting and should be taken with precaution if taken in combination with fish oil. Bruising should not be taken lightly. If fish oil causes you to be prone to bruising, visit your doctor immediately. Excessive bleeding and bruising under the skin may cause various health hazards and should not be ignored. Your doctor will be able to suggest the appropriate steps necessary to treat and prevent further bruising. Can Fish Oil Cause Rashes? Is Fish Oil a Natural Blood Thinner? Should You Take Aspirin With a Beta Blocker & Fish Oil? What Are the Side Effects of Salmon Oil Capsules?